Since 1981, Hertco’s European style cabinetry is known for virtually any custom sizes and Exotic woods and finishes, such as Brazilian cherry, Knotty Alder, and Hemlock. Hertco can customize any kitchen cabinetry with almost any color laminate of your choice, featuring a revolutionary poly-icing finish (clear polyurethane). With cabinetry, everyone is attracted to simplicity, beauty and function in form. 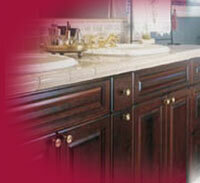 Hertco balances the appeal of their cabinets with the philosophy that your kitchen should be a place for living.